The Aries polished and satin chrome bathroom 3 lamp ceiling spot lights plate is rated IP44 and supplied with 4w LED bulbs. 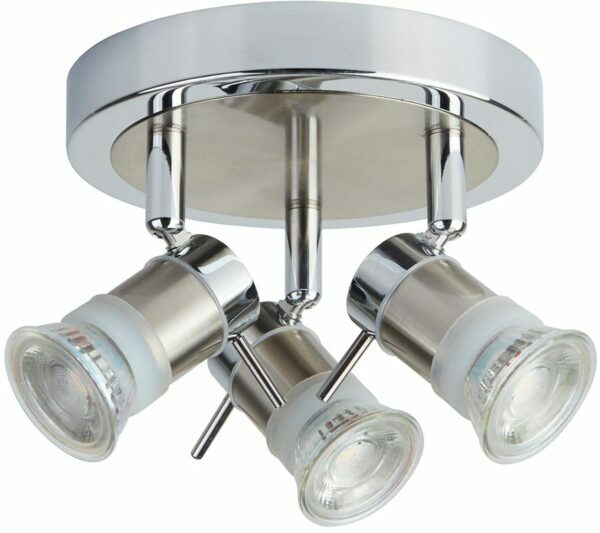 A modern polished chrome finish three-light bathroom ceiling spotlight plate, rated IP44 and suitable for bathroom zones 1 and 2. This ceiling spotlight plate is fully splashproof and supplied with IP44 rated LED lamps. Other fittings in the Aries bathroom lighting range can be viewed below and include a four-lamp spot light bar and switched single wall spotlight. Why not browse our complete range of IP rated light fittings? We’re sure you will find the right ceiling lighting for your bathroom from our comprehensive selection of light fittings designed with the bathroom in mind.